The perfect amount of suspense!!! We had so much fun. It's was more complex then I could have imagined. I appreciate the attention to detail and imagination. I can't wait to of it again! The year is 1947--the place, Los Angeles California. You, like so many others, are a young Hollywood starlet looking to make it big in Tinsel Town. As things go, you find yourself in the apartment of a local talent agent who has promised you fame and fortune. This is how things are in this town; all it takes is getting to know the right person to make you a star. But there’s more to this city than movies, glamour, money and jazz. In the shadows cast by the bright lights of the city lays a dark and dirty underworld-- a world where happily ever after is but a farce. Deep in this underworld is a man—no--a monster on the prowl, thirsty for the blood of young hopefuls. You should have known something was off about a drink call Devil’s Kiss--you thought something tasted funny about that drink--these are the thoughts that run through your mind as your eyes grow impossible to keep open. You have been drugged! As you regain consciousness you overhear someone talking on the phone—“I’ll be back by six o’clock” before the phone slams down. The front door opens then closes as your captor leaves you for an hour and you make your move! Can you uncover the secrets of his apartment before it's too late, or will your demise become yet another Los Angeles legend? 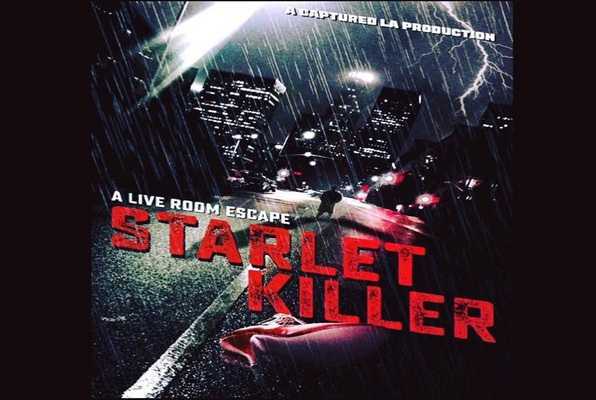 Reviews of escape game "Starlet Killer"
Captured LA is awesome and fun and creatively put together...I would recommend it and I want more! This was super fun! I would recommend this to anyone. One of the best escape games I have played! I can't wait for more rooms! I've played a ton of room escape games, and Captured LA is one of the best I've experienced. The puzzles are great - some were fairly difficult, and many of them required you to work with your teammates, whereas in a lot of other games, you find yourself solving stuff solo the entire time. Fantastic game, really nice guys running the room - highly recommend. Can't wait for the next room they open! I would highly recommend this place to others. It was my first time and had a great team that really worked together & we were able to escape! It was a good challenge for my first time. I applaud the creator of this particular escape room!